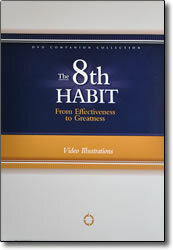 The concepts in these 13 award-winning video programs illustrate principles taught in Stephen R. Covey’s The 8th Habit: From Effectiveness to Greatness. They are designed to prepare you and your team to release your full potential in achieving new levels of success. Today’s knowledge age places a new set of demands on organizational leaders. Most importantly, leaders must be able to mobilize the unique talents of their teams to accomplish their organization’s critical objectives. Through these powerful videos, leaders learn to engage the heads and hearts of their team members by seeing them as “whole people” not just assets–or liabilities. To unleash the full, unique talent of each team member. This video has something for everyone! Thanks for the great discount.